This project will characterize the olfactory mechanisms that determine how Anopheles stephensi specifically targets humans for blood feeding versus other animals. If successful, we will create a genetically modified A. stephensi strain that will avoid feeding on humans. Release of this mosquito coupled with a gene-drive mechanism could lead to replacement of current, human-seeking, populations. This could effectively break the disease transmission cycle, leading to reduction or eradication of malaria. Eradicating malaria would be a revolutionary development as it is currently responsible for over 250 million cases of illness annually, resulting in over 400,000 deaths. Long lasting insecticide-treated bed nets in conjunction with indoor residual spraying have reduced malaria transmission by targeting mosquitoes with habits highly tied to feeding on sleeping humans within dwellings (notably Anopheles gambiae - Sub-Saharan Africa and Anopheles stephensi – Southern Asia). Mosquito repellents, habitat modification (to reduce larval development sites), and anti-malarial drugs also contribute to reductions in malaria cases. Despite these efforts, malaria remains a problem for U.S. service members and civilians due to insecticide resistance, Plasmodium resistance to anti-malarial drugs, and mosquito behavioral changes (aversion to insecticide-treated surfaces, and outdoor feeding preferences), among other factors. Alternative approaches are therefore needed for improved control or eradication of this disease. The most dangerous mosquito vector species are those that specialize in feeding on humans, facilitating rapid human-mosquito-human transmission of disease. This preference for humans is driven by the mosquito’s sense of smell, allowing it to discriminate human odors from those of other animals. The team will focus on Anopheles stephensi, an important malaria vector in southern Asia. This species is notorious for its preference for human feeding, yet many other species in the same genus display varying degrees of preference for humans or other animals, some with little to no preference for humans at all. Using comparative bioinformatics the team will determine A. stephensi odorant receptors most important for the selection of humans, specifically, as hosts. Vast amounts of genetic information on mosquito odorant receptors have become available due to the recent publication of 16 new Anopheline genome sequences, in addition to the existing A. gambiae genome. Comparisons of A. stephensi receptors with those of less anthropophilic species (such as A. quadriannulatus and A. christyi) and known A. gambiae receptors receptive to human odors will identify key receptors and variants that facilitate detection of humans. Further characterization of these receptors and mutational variants will be accomplished by electrophysiology using the “empty neuron” system in Drosophila, a technique frequently used to characterize insect odorant receptors, including many mosquito odorant receptors. Odorant receptors sensitive to human-specific odors will be disrupted or replaced in A. stephensi using genetic modification and could result in mosquito strains that are effectively blind to human odors. Such strains would greatly reduce or eliminate human feeding by A. stephensi, effectively breaking the malaria transmission cycle. This approach would allow an altered vector mosquito population to persist, feeding on other animals in the environment but ignoring humans, as do so many existing non-vector mosquito species that are of no medical significance. This is in contrast to insecticide-based or lethal genetic approaches that rely on mosquito population reduction. While lethal strategies can be effective in short-term reduction of vector populations, these strategies put considerable selection pressure on the mosquito population as a whole to develop resistance over time. Quick resurgence of mosquito populations (and subsequent disease outbreaks) can also occur if lethal control strategies are interrupted. This strategy may provide a more long-term solution of coexistence with vector mosquitoes by guiding them away from human-feeding, thereby preventing disease transmission, and avoiding the development of resistance. While fundamental in scope, this project is of direct importance for the protection of U.S. service members within malaria-endemic areas. In addition to reducing or eliminating malaria cases, complete success of this strategy could eliminate the need for cumbersome practices currently in use including insecticide-treated bed nets, residual indoor spraying, and dissemination and enforcement of daily doses of anti-malarial drugs, which have medical side effects in and of themselves. In addition to direct benefits to U.S. service members, this strategy would also reduce malaria cases for civilians in proximity to U.S. troops and would generate additional goodwill of U.S. military presence. 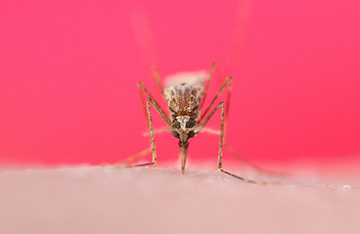 The goal is to identify key mosquito odorant receptors that govern mosquito host preference for humans and to genetically modify these genes to create mosquito strains that avoid biting humans. Using gene-drive mechanisms, these strains could be released to displace existing human-preferring mosquito populations, thus breaking the cycle of disease transmission.